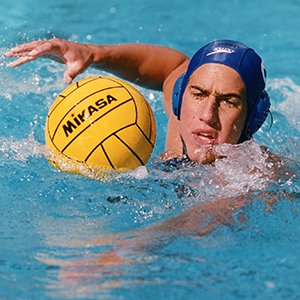 Andy Bailey was a four-year UCLA men’s water polo starter and finished his collegiate career as both an NCAA champion and first-team All-American. He was one of college’s best all-time defensive stoppers known as a 2-meter defender, consistently guarding the other teams’ top scorers throughout his career. A key starter on UCLA's 1999 NCAA championship men’s water polo team (he started with older brother and SC Jewish HOF inductee Sam Bailey) and the 2000 title squad (scored key goal in the NCAA victory), Andy finished among UCLA’s career leaders in scoring, assists and steals even though defense was his specialty. Andy was a two-time prep All-American at San Clemente while scoring 72 goals his senior year. After graduating UCLA with a degree in political science, Bailey continued playing water polo in the United States premier league while pursuing a career as a firefighter/paramedic. He was a key starter on the 2004 and 2006 Premier League Water Polo Championship Teams. Andy’s water skills allowed him to represent Team USA for International Lifeguard competitions in Australia and Japan. In 2006 at the Lifeguard World Championships, he was part of a rescue relay team that set a world record. He works for the Orange County Fire Authority.